Today I hold in my heart two boys who were bricked alive in 1705. 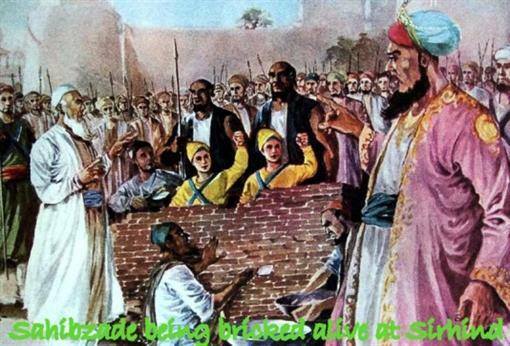 Zorawar (9) and Fateh (6) were the youngest sons of the tenth #Sikh teacher Guru Gobind Singh, killed by captors when they refused to give up their faith. They are shown in paintings hung in gurdwaras, their faces serene and stoic as men with scowls build brick walls around them. Today Sikhs around the world commemorate them as martyrs called “Chotta Sahibzade,” our little sons. A few years ago I visited the place in Fatehgarh Sahib, Punjab where they were killed, parts of the brick wall still standing, and the cartoon images in my mind fell away. I imagined them, two little boys surrounded by men who have decided to kill them, bricks stacking taller, sky disappearing, shortness of breath, air thinning, their resolution and their pain.